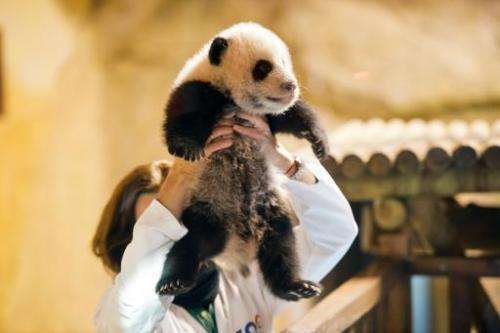 A keeper holds three month old giant panda Xing Bao during his presentation to the press at Madrid's Zoo on December 5, 2013. The zoo baptised the tiny panda—the male offspring of a giant panda that has already given birth to twins at the zoo—100 days after its August 30 birthday, in line with Chinese tradition. The name was chosen through a public online vote from a list of five choices. "At only three months, Xing Bao has become a strong and healthy panda weighing almost six kilos (13 pounds) that in recent weeks has started to develop greater strength in its hind legs and show its first incisors, which will allow it to start chewing bamboo leaves once it is six-months-old," the zoo said in a statement. 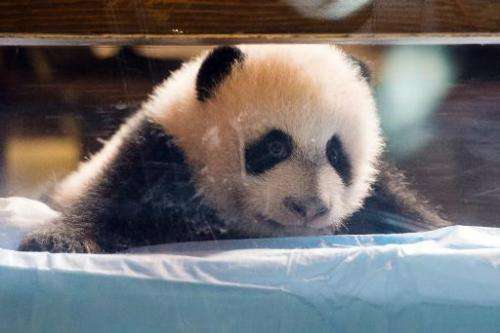 "Only after two years will little Bao become independent from its mother Hua Zui Ba, when it will cease to nurse and become totally auto-sufficient," the zoo added. The black and white cub has become a star attraction at the zoo, where it is put on display for just two hours each day inside a wooden cradle. Three month old giant panda Xing Bao looks out from its crib during a presentation to the press at Madrid's Zoo on December 5, 2013. It was the fourth panda to be born in the zoo. The cub's mother Hua Zui Ba first gave birth in 2010 to twins Po and De De, both of which were taken in May to China's Chengdu province to be released eventually to their natural habitat. Another panda, Chulin, was born in the zoo in 1982. The zoo submitted five names for the cub and Xing Bao came out on top with 39 percent of the vote, followed by Xi Fu, which means "Gift from Spain", with 27 percent. De Bao, or "Small one from Madrid", came in third with 14 percent, followed by De Mao, or "Cat from Madrid" with 12 percent and De Fu, or "Gift from Madrid" with eight percent.